A Davis weather station is a cross curricular classroom tool that can be used to enrich science, ICT and geography studies from KS1 through to A level. Easy to set up, students can use the Davis weather station for a wide variety of classroom projects, from meteorological measuring, data handling and storage, to setting up and using a weather reporting website. The Weatherlink data logger can store data over a period as long as a summer holiday, depending on the frequency of the data collected. This can then be downloaded to the schools computers at an appropriate time. 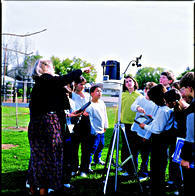 The standard software readily allows the weather data to be fed automatically into a weather reporting website on the Internet, so demonstrating the school’s environmental and technological awareness and raising its presence and profile both in the community that it serves and more generally across the world wide web. Students can participate in specific collaborative activities, including the MetLink project set up by the Royal Meteorological Society Education Department, and the GLOBE Program, an international weather monitoring project. Data from Davis weather stations in automatically formatted for transmission to the GLOBE program. More information about GLOBE is available at: www.globe.gov. More information about MetLink is available at: www.metlink.org. Importantly, Davis weather stations offer tough construction and simple maintenance. The whole system can be mounted together on our simple tripod, or for greater accuracy of wind speed readings, the anemometer can be set high up (eg on the school roof) and can either be linked to the other sensors via the 40ft cable (supplied as standard), or, if required, via a solar powered wireless transmission kit (with a range of up to 120m). The weather station can relay data back to the display console either via a wireless link or via a cable. For more details on things to consider when debating a wireless versus a cabled system read our page Choosing a System. 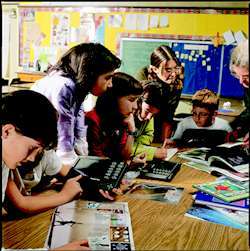 Many schools favour the convenience and ease-of-setup of a wireless model such as the Davis Vantage Vue and mount all of the sensors on the tripod. Although this is not ideal from the point of view of meteorological accuracy, it means that the complete system can be safely located in one place, and the brackets at the base of the tripod legs tilt, making it easy to locate on a roof or uneven terrain. But if you’re unsure about the suitability of wireless reception in your particular school building then the cabled Davis Vantage Pro 2 models are an excellent alternative. Davis have recently introduced a major enhancement to their data logger range with the WeatherlinkIP data logger. Several schools have shown a strong interest in this product because it connects directly to an Internet access point and allows the school to stream their own live and local weather data directly out on to the Internet and without requiring an intermediate PC to be set up and managed. Owning a WeatherlinkIP logger automatically enrols the school in a worldwide community of – currently, but growing every day – some 7000 weather stations literally all over the world, which can be seen on the community website at www.weatherlink.com. It’s easy to imagine the many lesson and project possibilities that this capability makes possible. And the IP logger has further advantages too. You can read more about the WeatherlinkIP logger on the lower part of our special webpage on this type of logger. Further reading: Martin Sutton. Head of Geography at Maiden-Erlegh Secondary School has kindly contributed a case study report to our website here, which candidly describes his school’s experiences in setting up a new automatic weather station. This report is essential reading for any school or college considering buying a new station for use in education. You can read Martin’s report here. More advanced Vantage Pro 2 weather station systems also available. Educational discounts may be available. Please enquire for further details.